Hi there!!! well I'm obviously a keen tramper but I also do a bit of fly fishing as well, my home town is Dunedin but I have lived in Milford Sound, Te Anau, Queenstown, Christchurch, Nelson and I'm now living in Westport. 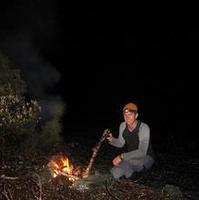 My favorite tramping areas are....... anywhere in a forest park or National park in the South Island. A couple of my bigger trips include the Dusky Track and the Five Passes Trip in the Mt Aspiring National Park. Some of the trips on my to do list include, Nelson to St Arnaud, St Arnaud to Lewis Pass, Arthurs Pass to Lewis Pass via harper pass. I have done a bit of tramping in Europe, in the Swiss Alps and the French Alps and also in the Andes in Peru and I have walked the Inca Trail.